Hadrian's Wall, one of the best known ancient monuments in Britain, is recognised throughout the world as one of the most impressive frontier works of the Roman Empire. It was inscribed as a World Heritage Site (WHS) in 1987. The second WHS Management Plan of 2002 recognised the importance of research for the understanding of the Wall. 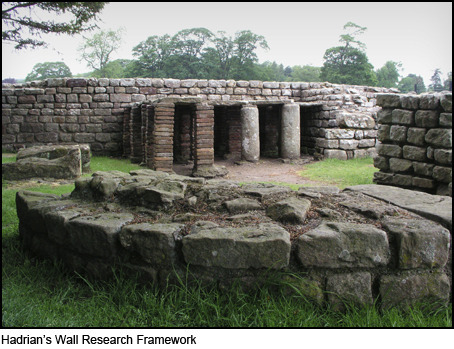 The Hadrian's Wall Research Framework is a response to the recognition of the essential role of research in the management of this internationally important site. The Hadrian's Wall Research Framework, a collaborative exercise involving a broad spectrum of specialists at the forefront of research in their own area of interest, has been prepared with two broad aims in mind. Firstly, it summarizes and assesses the existing knowledge base for our understanding including the surviving physical remains of the monument and its associated installations, the sum of evidence produced by investigations so far, and the collections of artefacts recovered. The scope of this exercise includes the remains of military installations in the area belonging to the period before the Wall was constructed as well as those along the Cumbrian coast. Secondly, it identifies and prioritises an agenda of key themes for future research and then sets out a strategy by which this initial set of objectives might be achieved. The Research Framework is designed to be a 'living' document with the Agenda and Strategy reviewed and, if necessary, revised at five yearly intervals. The full text of Frontiers of Knowledge, the final publication of the Research Framework, including the assessment, agenda and strategy is available for download from the links below.